https://www.knitnscribble.com knitnscribble.com: Top-down cardigan pattern, infant to 4XL, WOW! Top-down cardigan pattern, infant to 4XL, WOW! Just discovered this top-down cardigan knitting pattern from Tin Can Knits. It's a very versatile design, easy pattern, and is written in sizes infant to 4XL. 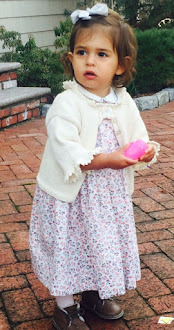 The sweater pattern is called "Harvest" and it is a free pattern. The unisex design is a great school sweater for children, minus the pin. 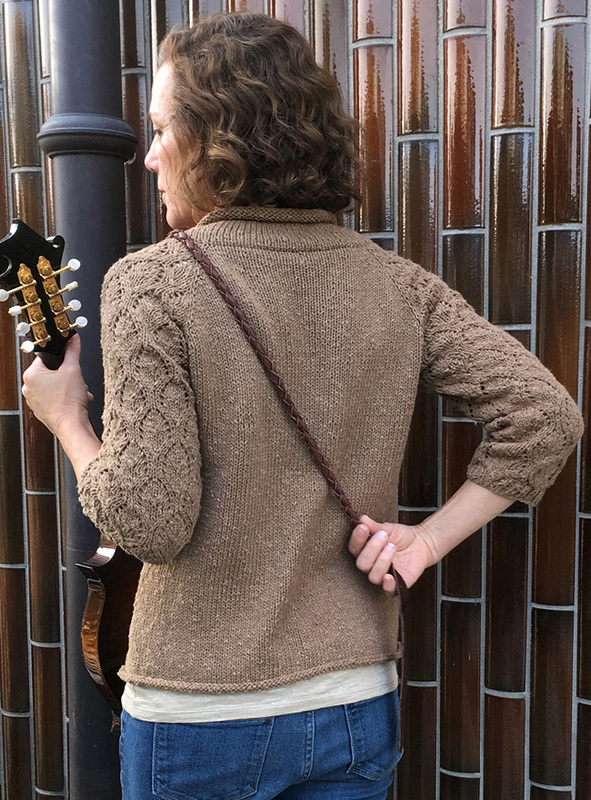 What a great way to begin your fall knitting with a one-piece, no sewing up sweater! That's right, once it's off the needles, this cardi is finished! With a very generous plus-size range, it is equally a generous gift from the designer. Harvest is knit with worsted yarn, using US 6 (4mm) and US 8 (5mm) needles. This one seen here uses Madelinetosh Tosh Vintage yarn, which is 100% Merino washable wool and a dream to work with. 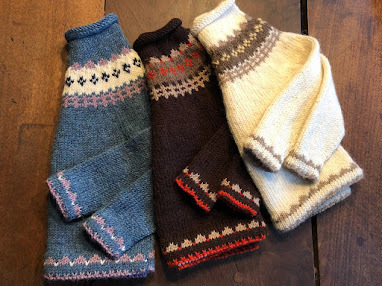 Knitter writes: "I have been knitting for 20 + years and this yarn is yummy~ Each skein is slightly different, so there is no dye lot, but it doesn't matter! Super soft, all the colors are great. Oh yes, I love it, in case you can't tell." Each skein has 200 yards, is hand-dyed and has no dyelot, and there are 54, count 'em, colorways. The top-down cardigan requires 250 to 1900 yards, depending on the size you are knitting. 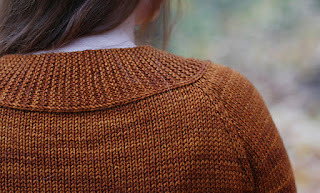 You'll find a knitting tutorial on Tin Can Knits site; Harvest is from its "simple collection." The raglan sleeves look very interesting. And the child's top-down sweater is perfect for boys or girls and great for school or play. But first, you must download the free pattern either on Ravelry or at TinCanKnits.com. 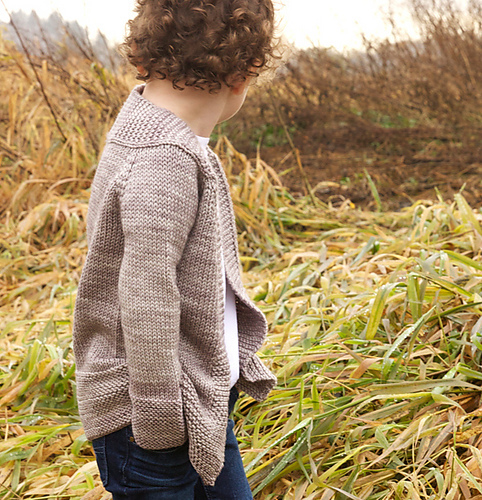 Harvest is a great first sweater pattern, easy enough for beginners. Learn to knit this summer! And for the more seasoned knitter, there is "Gibson" by Angela Hahn, free top-down pattern at Knitty. All "Harvest" photos are the property of Tin Can Knits.